Kerry, in an interview with PBS NewsHour’s Gwen Ifill, was responding to Nigerian President Goodluck Jonathan’s vow to free the abducted students by ordering a “full scale-operation” against Boko Haram Thursday. “I think an all-out assault — I’m not sure what that means; I’d want to know what that means — it could be very risky to the young women. And there may be a time and place for that but we need to look at this very closely,” said Kerry during the interview at the State Department. Kerry said he hope to be speaking with Jonathan some time “over the course of today or tomorrow” and said he was not aware of any requests for the U.S. to participate in any such operation. 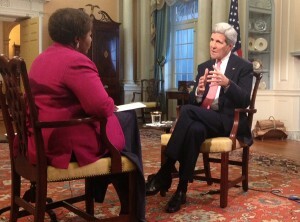 You can watch the entire interview on Thursday’s PBS NewsHour.